My first year of graduate school, I lived down the street from an appallingly awkward airline-themed café. The space was pleasant with floor-to-ceiling windows. It had those lovely columns that fewer and fewer downtown places seem to want to retain. Apart from the odd collection of 1960’s memorabilia (Braniff, Pan-Am, and TWA), there were these nice, fat couches strewn about a lofted area — perfect for passing out after too much coursework. There was also the food, which thankfully was nothing like what was served on airlines. The coffee was strong, good, and Italian. They never burned my espresso. They served little panini, cut into neat quarters that you could eat while burying your nose in a book. My favorite was simple: sliced egg on toast with truffled mayonnaise. Laura gifted me with a little tub of black truffle salt a while ago. Admittedly, I have parked myself on it for too long. When I finally decided to put it to some good use, the smell took me back to those early years when my worries were fewer. As I have expounded on how to hard boil eggs, and how to make mayonnaise on this blog before, I will refrain from further exposition. I will just say that you should use a neutral oil, like grapeseed or canola. Add about half a teaspoon of truffle salt to the mayonnaise at first, and then build up from there. I tend to make a saltier mayonnaise to compensate for the unsalted eggs. 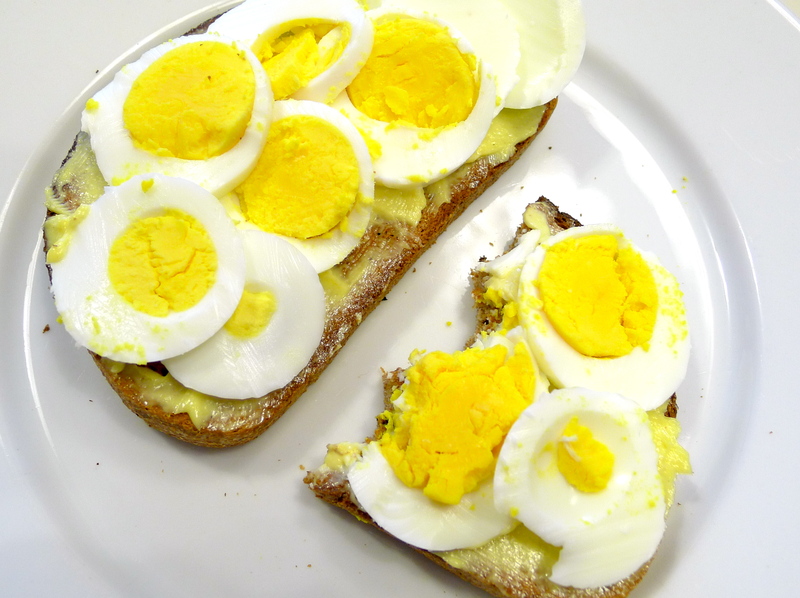 Slather each slice with the mayonnaise, and layer the sliced egg on top. Factor in about one egg per slice of toast. Truffles, mayonnaise, and eggs. I do the sandwich open-faced these days. It is wonderful. I was in such a hurry to eat it that I hastily, and sloppily sliced up the egg. I had crammed half of it greedily down my gullet before it occurred to me that I should take a photo. So please excuse the photographic evidence of my gastronomic enthusiasm!